Treatment of adult patients with active psoriatic arthritis. Where can I buy Cimzia? IPN helps patients, doctors and hospitals as a facilitator to import prescription medicine brand CIMZIA (certolizumab pegol) for injection on prescription and Import License in Patient's Name only. For CIMZIA or certolizumab pegol for injection cost price in India. Please call at M: +91 9811747774 or Email Us to know more details about the medicine and its cost price in India. 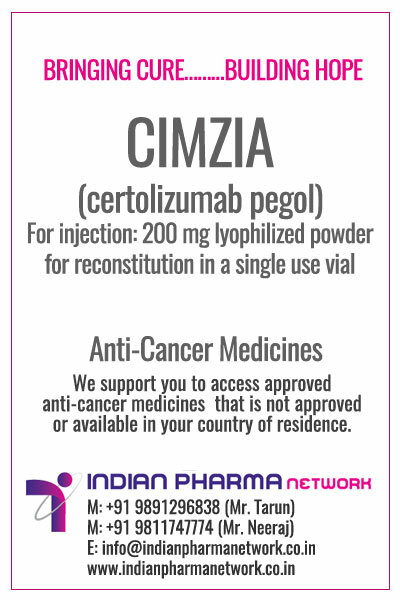 For Indian Patients, doctors and hospitals CIMZIA (certolizumab pegol) for injection can be made available to patients, doctors and hospitals at Mumbai, Kolkata, Hyderabad, Chennai, Ahmedabad, Delhi, Bangalore, Srinagar, Jammu, Jaipur, Chandigarh, Ludhiana, Noida, Gurgaon, lucknow and Pune and other cities in India. The order will be confirmed only after the receipt of valid prescription of doctor and import permit if applicable. For injection: 200 mg lyophilized powder for reconstitution in a single use vial, with 1 mL of sterile Water for Injection. UCB Announces the Approval of CIMZIA® (certolizumab pegol) for Moderate-to-Severe Plaque Psoriasis, Representing an Important New Option for Patients in the U.S..